Samsung Pay is supposedly meant to be a competitor to Android Pay and Apple Pay, but as it's currently only available in the US and South Korea it's not much use to most of the world. That might be about to change though, as SamMobile has received information that the mobile payment service will be launching in the UK, China and Spain in the first quarter of 2016. We were always expecting a UK launch at some point, so this rumour isn't unbelievable, but it is still just a rumour. 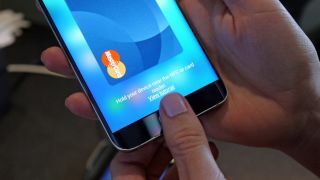 If true, though, we may be mere months away from seeing Samsung Pay and it's worth getting excited about: Samsung's payment service can work on almost any card terminal, even those without contactless technology built in. It does this by mimicking a card swipe, though it can also be used in the same way as Apple Pay where NFC is supported. That gives it a big advantage over rival services which rely purely on NFC terminals. Sadly it only works with Samsung devices, and more specifically only the Samsung Galaxy S6, Galaxy S6 Edge, Galaxy S6 Edge+, Galaxy Note 5 and Gear 2 for the time being. But if you've got any of them, your iPhone-wielding friends could soon have something to be jealous about. Contactless payments may be supported everywhere by 2020.